This isn’t about the game often played by kids. But it is telling that these are important enough materials from which to create a game. Value, even power, can be found in the simplest of objects. It can be easy to overlook them, yet when desired they need to be close at hand. Several events the past couple weeks have made me reaffirm their good and various uses. My eyes are resting on split “thunder eggs” my son brought back from rock hunting in eastern Oregon. 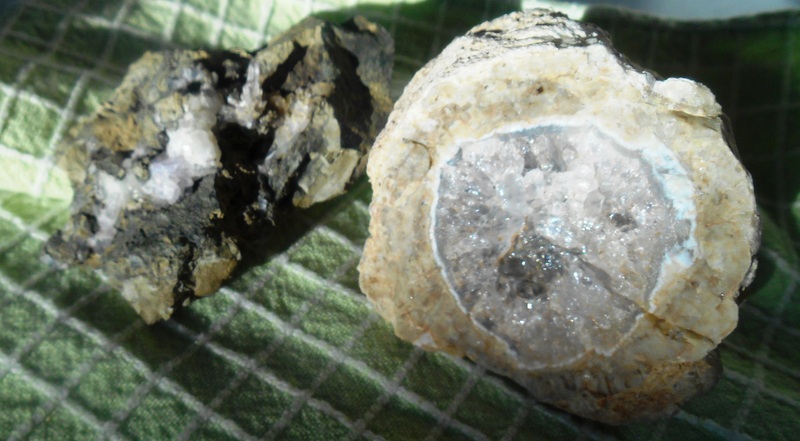 Broken open, they reveal lovely mineral crystals. Josh is an outdoors pilgrim, someone always alert to and in search of earth’s gifts, attuned to the power and complexity found therein. His interest in rocks and minerals has gained momentum the last couple of years. He talks of them fondly as he spreads them out on a cabinet, arranges a few on his mantel. In his hands they become more themselves as he explains what he sees and what he’s learned. His children camp, hike and nature hunt with him. My grandchildren can identify and hold forth on quartz, slate, granite, mica and jade as if they were common household goods. The grandson safeguards them in little cloth bags. But mostly they just love to touch, look. Prismatic minerals wink in the light and reveal an aged beauty. My husband gathers river stones; he carries one in his pocket. I have a revolving group of agates from Oregon’s beaches that have a place on my bookcase. I admire them each time I get a book or dust. Rocks fortify me. They make indoors and outdoors landscapes more inviting with their sculptural applications, multiple textures and geological history. People build with them–houses and fireplaces and fences. 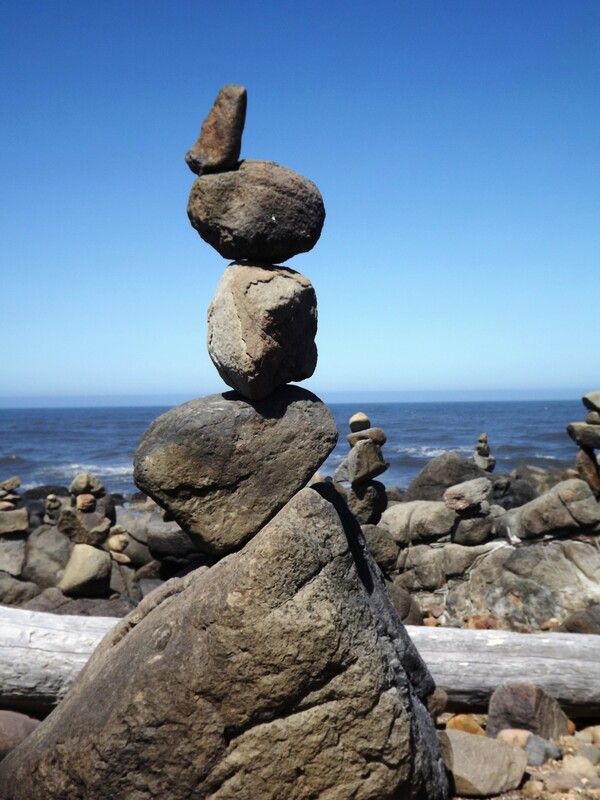 Or towering cairns within tide pools we frequent. You can smash things with them. A smaller rock, a venomous insect that looks like it wants to keep house with you, a nut or seed that has interesting innards. Stones and rocks belong to us as much as to the earth. The dark forms beckon from watery homes. Rest beneath us on a forest floor, line paths and roads, roll from hillsides and mountains to our feet. As children we find them endlessly entertaining–to throw at trees, skip across water, to build small designs and mark hopscotch numbers on asphalt (more rock). They can calm us, snug in our palms when nervous. We contemplate one found in the path as if meant for our eyes alone. There is nothing quite like a stone in hand if cool and smooth, shaped to fit right there. Our earth can be carried with us and that is no small thing. Paper. I almost am afraid to speak of it! People recycle it which is fine, but don’t want to give you receipts or bags at the store. There is talk about how it is disappearing as if trees weren’t replanted, clearcut areas not being reforested. I live in the Pacific Northwest–we have trees galore. We sometimes hug them here. So I try to be thrifty with paper but I like to have it around to use. Physical books are taking up less room at the big chain bookstores. Our home is dominated by books, mostly used ones as I do want to participate in the recycling bit. And there is paper everywhere in the form of prints, paintings and drawings. There are gifts from family and friends made of paper products. I print things from the computer that are useful, often filed away. Paper in my hand is still important–to see it, handle it, smell it. What do my grandchildren want to do when they arrive? We draw with pen and pencil. Cut and construct things from paper. Paint with my watercolors on paper. Erect small buildings from geometric shapes and fly planes made of it. We use cards made of paper, keep score on scorecards during Yahtzee. We play checkers and Scrabble on cardboard game boards. Decorations are created from colorful sheets as well as chains, crowns, birthday cards. Paper defines many activities. I always have plenty of it around. I scibble lines of poems dreams, or ideas in notebooks when awakening in the dead of night. 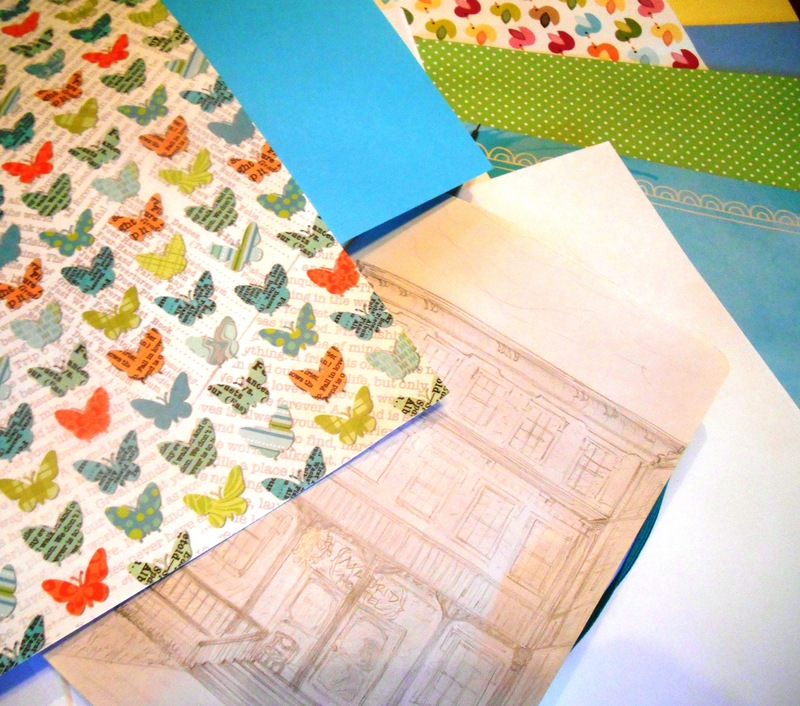 I shudder to think of the art that would not created if not for everyday yet extraordinary paper. Last week I sketched an old building I saw when visiting my daughter in New York and it was restful, quite happiness-making. Ah! paper! Though not noted in the title, I must mention tape. I was at the post office yesterday and needed tape to secure the envelope carrying a gift to a daughter. A last eight of an inch was ripped from a roll left for customers and when I stepped up to the window, the employee didn’t have any, either. I had a moment of concern. Easy for her to say. My little parcel was likely the least of the office’s concerns. And I am certain sturdy tape helps packages make their way intact. As it should; that is its design and function. I have packed up households many times over decades and thank goodness for cardboard boxes and tape, otherwise my things would end up in shabby piles, leaving a path from room to moving truck or van. Dispossessed. But that isn’t the only function. 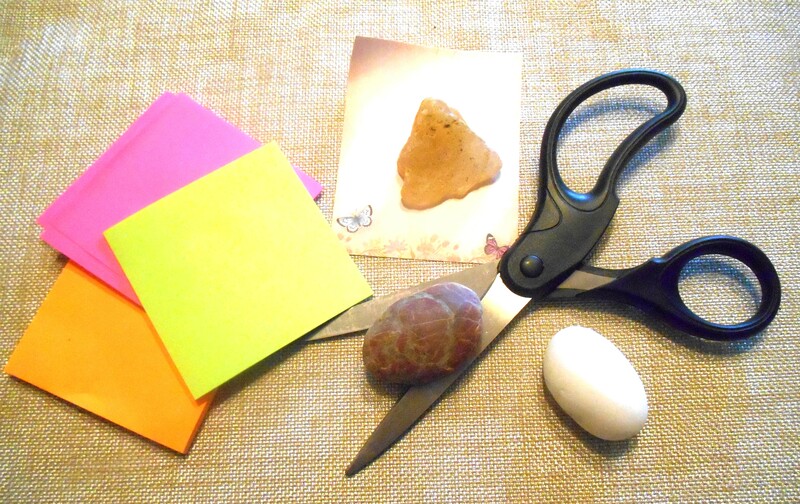 Try making papery things without it–a sailboat, a hat, a baking soda and vinegar volcano, decorations. Think of all the pictures on the frig that fell down due to cheap magnets: tape to the rescue. I used to roll out butcher block paper by the yards for our kids to draw on, tape it on the wall and let them have at it. Voila, a mural. 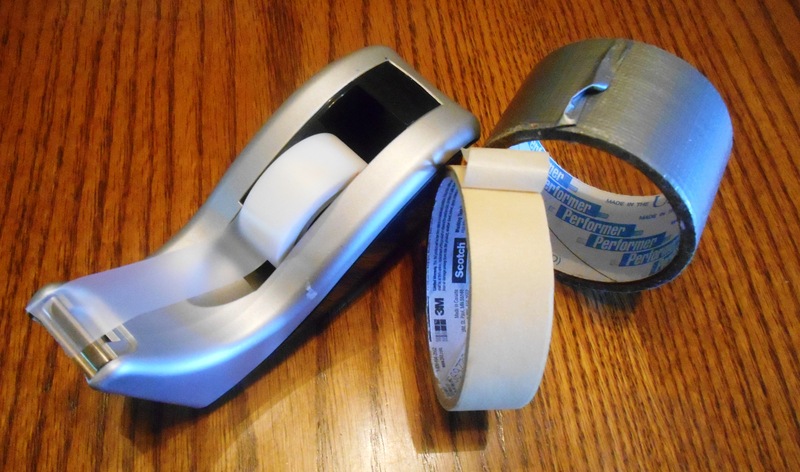 Anything that doesn’t want to be stapled or paper-clipped requires tape. 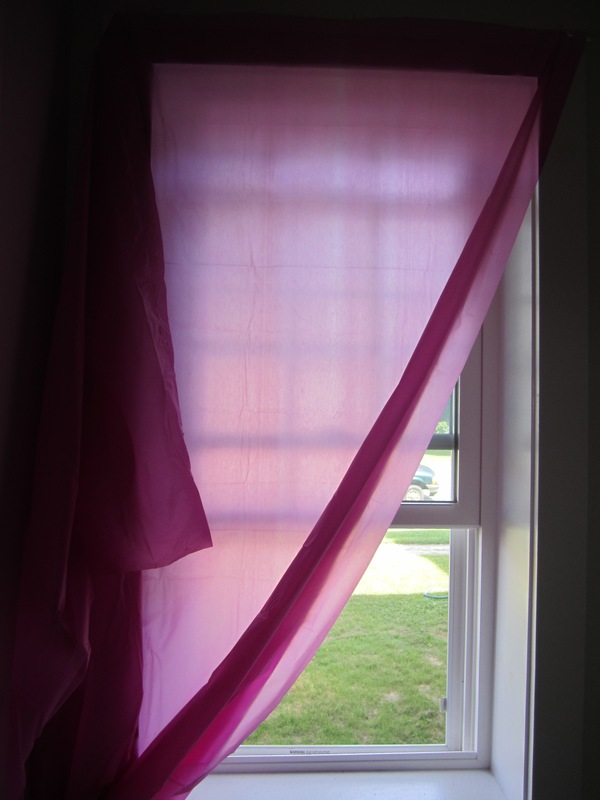 Wrapping gifts, repairing torn book covers, fixing a loose hem in a rush, securing a spare pink shower curtain to a bedroom window before you have found the right curtain or rod. Nothing is safe in the home without tape at the ready. On the other hand, I have seen my kids and grandchildren tape each other’s mouths shut or fingers together; tape can be used for surprising things. I once affixed my car’s sagging bumper up with heavy-duty electrical tape until it could be repaired. I would never have made it this far without tape. I like to peruse it in the hardware, all the colors and variations feeling like creative stimuli. I won’t run out of tape. Before we had scissors we had knives or very sharp rocks (see: rocks, again). Although box cutters and utility knives are handy for some jobs, scissors can be required. Very sharp ones are preferred when something needs to be divided into various lengths. 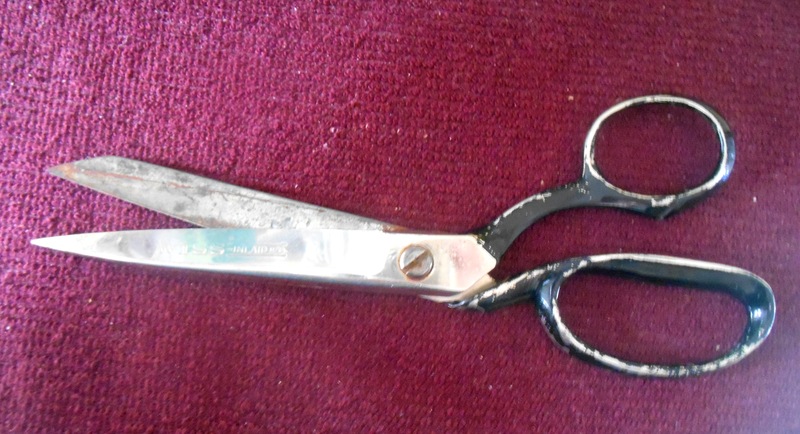 I used to love watching my mother cut fabric with her worn Wiss scissors or the nice Fiskars. She had eye-hand coordination that I deeply admired. She looked a second, then slid those scissors across wafer-thin, even fragile material with nary a catch. Velvets, corduroys, taffeta and woolens required more careful cutting but edges always were clean and exact. She knew how to wield that cutting tool. I use various scissors to open food packages, trim nails, slice open heavier-gauge envelopes, refresh flower stems, cut up meat, tame thorny bushes, size wrapping paper and curl ribbon, even up wayward bangs, remove pictures from magazines for collages I keep planning on creating. But mostly, I wouldn’t consider raising a family without scissors anymore than I could feature that without tape and rocks. How would we make paper dolls or tiny boxes? Exquisite snowflakes? Mobiles or booklets? Cheery Christmas trees and floating planes? Sometimes I think we have become too sophisticated and trendy in our wanting and acquiring. There are more gadgets than I will ever use out there. I was recently at a store that was full of customers laden with things I hadn’t known about. Or didn’t need. A garlic smasher? How about the flat side of a knife? Boxes of bright, many-sized metallic clips for chip bags? How about using big paper clips–how about tape? I’m not against progress, investing in a tool that works far better at a reasonable cost. But it is the simple things I find myself going back to and appreciating. It is what those basic tools can do for us–for less hassle and cash–that I enjoy. They create avenues of exploration. Solve problems. Take care of an emergency. Make something beautiful or silly. Create a way to say “I love you” and “thank you”. Take us into a world enlivened by constructive activity, help us use time in a leisurely fashion. Make it curiously satisfying. My parents were educated folks yet I can recall my father re-hairing a violin or cello bow, scissors and glue at the ready. Above his workbench was an array of tools that helped make damaged things new. And I can see my mother with several straight pins held between her lips as she folded a hem, and hear her instructing me to cut the thread so many inches, then try my hand at it finishing her work. I well remember how I cut out and taped pictures on a large poster board of Grecian islands or Alaskan wilderness I wanted to visit, of admirable people or fashions. There were poems I was compelled to write with colorful letters snipped from magazines. The posters were hung above my desk. I frequently changed the exuberant or moody creations. My youth, my thoughts and dreams, were plastered there thanks to all the basic tools. Living has always seemed very hands-on to me even though I often camp out in my brain, too. Doing, making and fixing things brings knowledge and satisfaction, and that is worth every effort. I hope others still often well celebrate the humble rock, paper, scissors. Pick one up. Discover something surprising. Develop something fresh for the heck of it. Fix an error. Make something whole again. Let something unexpected and fun happen before you forget the simplest things.